We strongly suggest that if you can make the trip to Rochester, Minnesota to visit us that you do. You will find OLEANA’s oldest and only dedicated OLEANA Boutique featuring the entire OLEANA Line and with a Staff of OLEANA Experts that can assist you with your next purchase. They know the entire line from the first sweater and wristlet all the way to the current Collection. If you can't make it to our Store we have set up an On-Line OLEANA Boutique for you to view the entire Collection including the latest Season's additions. 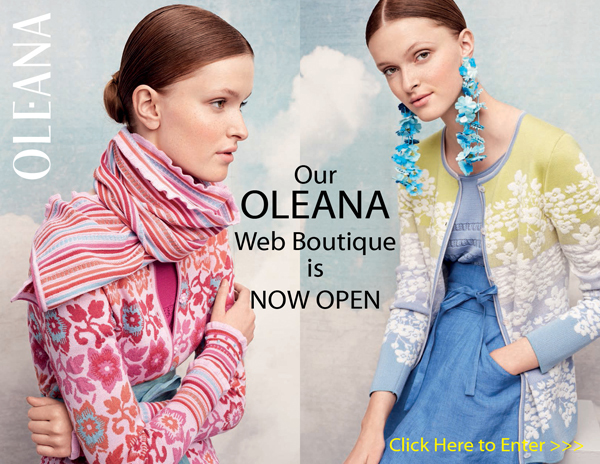 OLEANA does not allow us to sell their items over the Internet. However our OLEANA Staff is more than happy to talk with you and take your order. Join us for a video journey back through the First 25 Years of OLEANA and a Glimpse at the Future as seen through the eyes of the Next Generation at OLEANA as they start taking the reins.